There’s nothing like a beautifully designed landscape wall to make a yard look professional. Whether its sidewalk edging, flower bed borders, tree rings or a retaining wall you’re looking for, Keystone’s Garden Wall has become the first name in retaining walls. Developed for home use, a Keystone Garden Wall can be built straight, curved or terraced depending on the contour of the yard. Interlocking units, made of high-strength, low-absorption concrete come in various sizes, depending on the scope and specifics of each project. Choose from the standard – a good choice for tall walls or critical structures; the compact – a lighter weight and shorter tail design for smaller wall; or, the mini and cap – a great solution for small applications and to top off a larger wall. 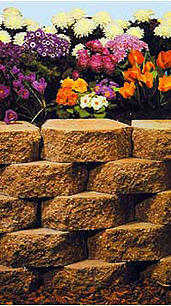 Garden Wall features the natural look of quarried stone and earth tone colors that blend beautifully with any landscape. This outer beauty is paired with inner strength using Keystone’s patented fiberglass pin system that ensures a strong connection between the wall and soil reinforcement. ? Garden Wall is the perfect alternative to treated wood or timber walls, which deteriorate over time and may contain chemicals that leach into the soil.